Publisher: Philosophical Library, New York. 1934. Condition: Hardcover, no dust jacket. Very good. Slight tanning to cover and endpapers. Binding tight, text clean. Pocket size. An abridged edition of Einstein’s The World As I See It. This abridged edition is the first English translation of the original German Mein Weltbild. 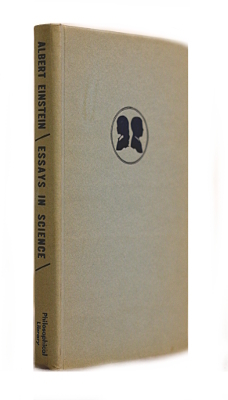 Contains lectures on Niels Bohr, Clerk Maxwell, Kepler, Newton, and his theory of relativity.